The university’s STEM Innovator program and the U.S. Patent and Trademark Office (USPTO) will combine their expertise to help teachers and their students understand the connections between innovation, entrepreneurship, and intellectual property. 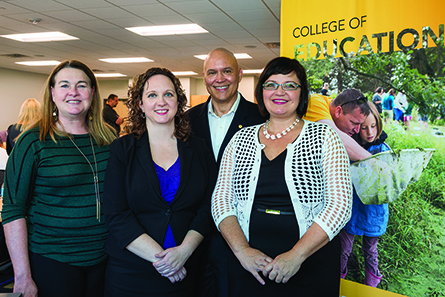 Leslie Flynn (from left), University of Iowa science education professor and co-founder of STEM Innovator; Denise Sylvester, outreach officer with the U.S. Patent and Trademark Office in Detroit; Jorge Valdes, USPTO education program advisor in Washington, D.C.; and Dawn Bowlus, director of the Jacobson Institute for Youth Entrepreneurship and co-founder of STEM Innovator, attend the Oct. 11 teacher training session held in Iowa City.Photo courtesy of the Jacobson Institute/Mark Tade. STEM Innovator is a collaborative effort of the UI’s Jacobson Institute for Youth Entrepreneurship and the UI College of Education. STEM Innovator’s teacher training equips teachers and administrators with the tools they need to develop their own model for educational innovation in the classroom. Its curriculum helps students identify and solve problems, gain college and career readiness skills, and understand how they can market their STEM ideas. Dawn Bowlus, director of the Jacobson Institute, says the USPTO’s teacher training on intellectual property concepts is a natural extension of the STEM Innovator framework. The partnership agreement will combine the two training programs into a workshop that will be taught by instructors from both STEM Innovator and the USPTO. The first workshop was held Oct. 11 at the University of Iowa Kirkwood Regional Center in Coralville for Iowa secondary teachers. The second will take place in the spring in Washington, D.C., and the third will be conducted online. “The workshops will explore how STEM, entrepreneurship, and intellectual property can be used to provide students with essential tools for real-world problem-solving, invention, entrepreneurship, and innovation,” says Leslie Flynn, science education professor in the College of Education who created the STEM Innovator program with Bowlus. More information about STEM Innovator is available at www.steminnovator.org.